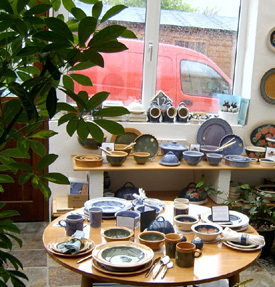 Bandon Pottery Shop moved in 2003! My new Studio Showroom is open to the public, in a sunny conservatory adjacent to my Studio, set in the tranquil countryside of West Cork, just 8 miles from the centre of Bandon Town. Bandon is only 20 miles west of Cork City on the N71, the main route to West Cork. Click here for map. Click here for directions from: Bandon; Dunmanway; Skibbereen; Clonakilty. You are welcome to visit me here, where you can park your car and browse at leisure through the well-stocked shelves displaying the entire range of Bandon Pottery, as well as lots of one-off pieces, and bargains in discontinued lines and "Seconds". I will be only too pleased answer your questions, and to help you find the piece you are looking for, whether it is an addition to your own collection or a special gift for someone else. If you find it impossible to choose, you can always buy a Gift Voucher, redeemable at any time for goods of any value from €10 upwards. A Wedding Gift List service is also available for couples who want to make life easier for their guests. Please contact me for details. The shop is normally open throughout the year, from 11.00 a.m. to 6.00 p.m., but please telephone to make sure I'm home: 023 8847843 or 087 2401738. I can usually arrange to be open at other times (evenings or Sundays) if you let me know when to expect you. Sign up for my free newletter, to get information about new products, special offers and money-off vouchers available only to mailing list subscribers.